Senior Ryan Elmquist has just been named to the D3hoops.com All-West Region Team. 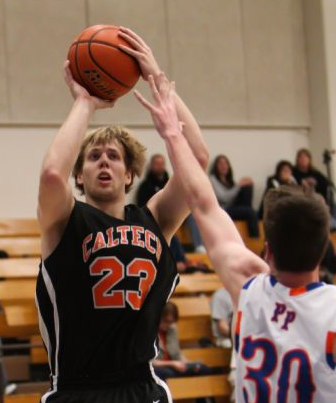 This is the first time any Caltech player has been awarded this honor. Players were nominated for these awards by the Sports Information Directors at the various schools, who were contacted multiple times as the season wound down to remind them to make their players eligible. There were 680 players nominated nationwide, a new high. The ballot was then made available to SIDs, who voted for a predetermined number of players in their region. Elmquist will graduate this spring as the program's 2nd all-time leading scorer, leading shot blocker, and leading free throw maker. Last month, he was awarded the SCIAC Ted Ducey Award and named Academic All-District. He is a 2-time SCIAC Athlete of the Week.